The program book is now available. The scientific program is live! Please click program book to view the program details. The meeting will span four days. Each of the first three days will be organized around an integrative theme that helps define our current understanding of forecasting space weather. The final day of the conference will be devoted to synthesizing discussion from the previous three days and defining new research directions. The first day’s theme will be: scientific aspects of the space environment that limit forecasting effectiveness. 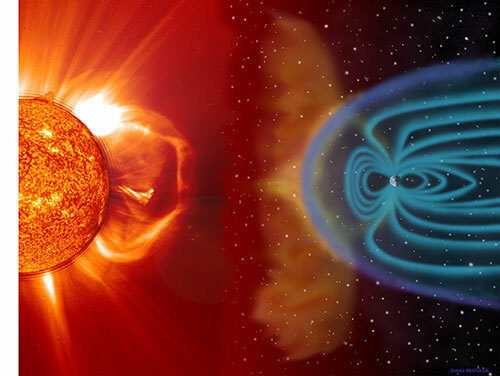 This theme encompasses all SPA disciplines: solar/heliosphere (SH), magnetosphere (SM), and ionosphere/thermosphere (SA). The third day’s theme will be the scientific aspects that are favorable to meeting forecasting goals, for example, those aspects of the space environment that are more deterministic and predictable. An important question to raise is the nature of realistic forecasting goals: what can be accomplished? On both of these days, blocks of talks are followed by discussion periods of 30 minutes. Discussion is a main focus of the conference. The second day’s theme will be forecasting space weather extremes. A poster session will conclude the second day. Since this is the only poster session, the poster topics can be broad and need not fit the second day’s theme. The poster session will be an excellent opportunity to introduce highly innovative concepts and for early career participants to express their perspectives. The poster session will be preceded by a "lightening round" of 1-minute poster introductions by the poster presenters. On the third day, following the talks and discussion periods, we will organize meeting attendees into discussion sub-groups. The sub-groups will follow the different SPA disciplines: solar/heliosphere, magnetosphere, ionosphere/thermosphere (aeronomy), and a cross-cutting group emphasizing non-linear systems, numerical methods and data science. The sub-groups will discuss the first three days of the conference from the perspective of their discipline. The following should be addressed: is it convincing to suggest that space weather can be forecast within a reasonable set of expectations (which will be proposed prior to the meeting)? How convincing were the speakers that suggested space weather forecasting is tractable? How can limitations be addressed and what are the forecasting implications of those limitations? What are reasonable near-term targets for forecast accuracy in each domain? What approaches appear most promising? What fundamental research is most needed? What are the crucial observations? What can techniques from data science and dynamicsl systems theory offer for space weather forecasting research? On the fourth day, each SPA discipline sub-group, and the cross-cutting sub-group, will present their perspectives on these questions. The material will be synthesized in the discussion period before lunch. The remaining afternoon of the conference will treat concrete actions such as dates for the report, engagement of the various funding agencies, etc. Publication plans will be finalized during this discussion. A purpose of the wrap-up is to discuss how the Conference can have a lasting influence on the field.